1. Why does the EU services sector need a fresh boost? We live in a services economy. The services sector is the largest component of the EU's economy (70 % of GDP) and generates most of the jobs (90 %). 40% of the value of EU manufactured products stems from services inputs. Nowadays manufacturing activities also increasingly depend on and are bundled with many services. No good is manufactured and marketed without important services inputs, be they research and design, accounting and advisory services, computer and information services, marketing services, or after-sale services. The performance of EU manufacturing is increasingly linked to the competitiveness of services. Barriers to trade in services in the Single Market are therefore barriers to the competitiveness of EU manufacturing and thus to job creation and growth. Regulated professional services are a fundamental part of the services sector and their contribution is felt throughout all sectors of the economy. Around 50 million people - 22% of the European labour force - work in one of these services. While regulation is often warranted for example for professions linked with health and safety, there are many cases where unnecessarily burdensome and outdated rules can make it unreasonable difficult for qualified candidates to access these jobs. This is also to the detriment of consumers. The EU is currently making an unprecedented effort to stimulate the economy and unlock investment, in particular via the Investment Plan for Europe, a positive fiscal stance in the European Semester and with expansionary monetary policy by the European Central Bank. These policies need to be underpinned by structural change to foster innovation and growth. It is therefore crucial to focus on improving the functioning of the Single Market and the removal of barriers to investment, at the national and European level. With this in mind, the Commission has tabled proposals on the Digital Single Market, the Capital Markets Union, the Energy Union – and of course the Single Market Strategy. Giving a fresh impetus to the services sector is at the heart of the Single Market Strategy – a roadmap to deliver on President Juncker's political commitment to unleash the full potential of the Single Market and make it the launchpad for European companies to thrive in the global economy. The Commission has already put forward proposals on e-commerce, guidance on the collaborative economy, steps to modernise the EU's standardisation policy and a Start-up and Scale-up Initiative. Now it is time to focus on the services sector. The EU already has agreed on rules to make it easier to provide services in the Single Market. But in practice, obstacles to the growth and exchange of services in the EU still remain, including complex administrative procedures. Obstacles to market entrants may not always be necessary to ensure high-quality services of domestic or foreign service providers, and in practice can deprive consumers of a wider choice of services at better prices. Removing unjustified barriers would create opportunities to enter the market for professionals and new companies operating domestically or across borders, improve competitiveness and ensure wider choice and better prices for consumers, especially in the business services and construction sectors, while maintaining high standards for consumers and workers. Evidence shows that Member States with fewer obstacles to cross-border competition perform on average better than Member States with more restrictions. Moreover, in a digital world it is particularly important to offer simpler, fully electronic ways for professionals to handle all the administrative requirements to offer services in another Member State all while respecting local rules. And this is not just about fostering cross-border business. It also provides host Member States with easy access to information on services providers and facilitates cooperation between authorities. The Commission aims to support Member States in their efforts to have balanced (or "proportionate") regulation in place in the area of services and regulated professions. 2. How are services providers currently regulated? The fundamental principles of freedom of establishment and freedom to provide services established in the Treaties as well as the 2006 Services Directive are key pieces of EU law for services providers. They aim to make it easier for a service provider to set up a business in another Member State or offer services across borders. The Commission is not reopening the Services Directive but presenting proposals to facilitate the application of some of its provisions since it is estimated that its full implementation could add 1.8% to EU GDP. In parallel, the Commission continues to monitor the correct application of the Directive by Member States. Where Member States still have disproportionate restrictions to the freedom of establishment or to provide services cross-border in place, the Commission addresses them through appropriate enforcement action, such as most recently in November 2016. Moreover, the reform guidance in this package also addresses regulatory issues in a number of professional services areas (see below). The EU also has a number of mechanisms in place (eg. Solvit) that allow to deal with problems encountered by citizens and business in a faster way. The regulation of services and professions, e.g. company form requirements, shareholding requirements, the decision about which services providers need to meet a certain type of training, membership of a specific organisation is a Member State prerogative, but according to EU law must be non-discriminatory and justified and proportionate to meet legitimate public policy objectives such as public security. 3. What is the European services e-card? What will it do in practice? Responding to the digital needs of today's world, the European services e-card is a fully electronic procedure to make it easier for providers of business services (e.g. engineering firms, IT consultants, architects, travel agencies) and construction services to complete the administrative formalities required to provide services in another EU country. This legislative proposal (including a Regulation and a Directive) foresees that the e-card application would be made in the home country and national language. The home country verifies the necessary data and transmits it to the host Member State, whereby the information will be automatically translated. The host country assesses the application, retaining its power to apply domestic requirements. The host Member State can also reject an application if justified. A service provider can request an e-card for a specific service activity in a given EU Member State. The e-card will be available both for temporary provision of services and for opening up branches and agencies (secondary establishment), although following different procedures (please see workflows below). It does not affect existing employer obligations or workers' rights. The e-card is not compulsory. The service provider can choose to apply for the e-card or request to provide services in another EU country following procedures already in place. The e-card will build on the existing Internal Market Information System (IMI) facilitated and funded by the EU. More than 5000 federal, regional or local authorities are already registered with IMI, so there is no need for new bodies. 4. Is the e-card an attempt to introduce the country of origin principle and limit existing rights of host country authorities through the back door? No. The authorities in the host country retain their power to decide if a service provider complies with all requirements to be able to provide services in its territory. The e-card aims to facilitate the administrative procedure for service providers wishing to expand to other Member States. The Commission is not changing underlying rules and regulations and certainly not reintroducing the country of origin approach. Under the e-card, the home Member State checks what happens on its territory and the host Member State checks what happens on its territory. Each country remains fully in charge of what happens on its territory. The e-card will offer administrative simplification to businesses wishing to provide services in, or expand to, other Member States. Member States will keep their prerogatives to refuse an incoming service provider or to revoke an already issued e-card for overriding reasons of public interest allowed under the Services Directive. The e-card will have no impact on rules concerning e.g. social protection (including workers' rights and employer obligations), consumer rights, health and safety or the environment. The host country authorities retain their power to decide if a service provider complies with all requirements to be able to provide services in its territory. 5. Will the card affect rules on posting of workers and on social security? No, the e-card initiative will not change any rules and obligations in these areas. For instance, rights of workers, obligations for companies and related national controls on payment of the necessary remuneration to posted staff remains subject to the rules governing posting of workers (Directive 96/71/EC and Directive 2014/67/EU). The e-card in no way limits control possibilities of host Member States, such as inspections on building sites. On the contrary, Member States accepting advance declarations of posted workers via IMI (from e-card holders) will get more information about the company posting staff. Member States are not forced to use IMI for this purpose but can continue to use their national system. There is no contradiction or overlap with the revision of the Posting of Workers Directive and the European Pillar of Social Rights. 6. How will the initiative affect administrative formalities related to posting of workers? If a Member State allows completing the declaration relating to the posting of workers (stemming from the Posting of Workers Enforcement Directive) electronically, the European services e-card shall direct the card holder to the relevant national procedures. Providers who hold an e-card may also submit this declaration through an electronic platform connected to IMI if this possibility applies for the posting of workers in the host Member State. In the latter case, the service provider would fill in details on posted workers in a pre-defined, multilingual form appearing in the home Member State language(s). In the host Member State, information would appear in the local language(s). 7. Who can apply for an e-card? Self-employed people and companies which provide business services and construction services that already fall under the scope of the Services Directive. Activities entirely or partially excluded from the Services Directive cannot benefit from the e-card (e.g. lawyers, notaries, statutory auditors, services in the field of healthcare, transport, telecom, private security services, temporary employment agencies are excluded). 8. Why target these services sectors? These sectors represent together about 20% of EU GDP and employment. Over the last decade, they have undertaken very limited cross-border trade and investment. For example, cross-border trade in business services sectors, such as architecture or engineering services, amounts to only 4% and 5% respectively. The same applies for permanent investments in these sectors in other EU countries. 9. What simplification will the e-card bring in concrete terms? Today, according to host Member State rules, a construction company wanting to provide services on a temporary basis in another EU country must often submit documents proving establishment for every contract they undertake, in the language of the host Member State. Most of the time supporting documents must be accompanied by a certified translation, which is expensive for the company. Separate procedures need to be complied with for professional qualifications and seconded staff. In contrast, once an e-card has been issued, it is valid for the life time of the company in the home Member States (unless changes of its legal status, criminal procedures or fraud). The application is made online. No separate paperwork, no repetition for each contract. The company asks for a card in its own language, and gets the administrative support of its national authorities. Service providers holding an e-card may submit declarations in relation to the professional qualifications of seconded staff through an electronic platform connected to the Internal Market Information System (IMI). Such declarations will make use of multilingual forms providing automatic translation of standardised information. As regards declarations of posted workers on the basis of the Posting of Workers Enforcement Directive (Article 9), service providers holding an e-card will be directed to relevant national electronic procedures via IMI, provided that Member States have such in place. If a host Member State has chosen to allow use of IMI for this purpose, e-card holders may submit such declarations through multilingual forms through IMI, completing forms in their own language. In the latter case, the service provider would fill in details on posted workers in a pre-defined, multilingual form appearing in the home Member State language(s). In the host Member State, information would appear in the local language(s). Today, an engineering company wanting to set up a branch in another EU country may need to obtain an authorisation from the host Member State regarding its corporate structure and insurance coverage. All this can take up to 16 weeks. Most of this is paper-based requiring authenticated documents with certified translations. With the e-card, an application online to its home Member State suffices. The home Member State will then liaise with the host Member State with a view to confirm that the e-card can be granted. Altogether, the e-card procedure aims to deliver permission to set up a branch in Member State and a certificate for insurance within 7-9 weeks. This could save the company several thousand Euros. 10. How can you obtain a European services e-card? A service provider wishing to apply for a European services e-card does so online, via the Internal Market Information system (IMI). The application will be transferred to a single coordinating authority in the home Member State. The authority will process and verify the application and liaise with the host Member State. This means that the provider has a "one-stop-shop". 11. Is the e-card valid in all EU countries? Can the company go and provide services everywhere in the EU with the e-card? No, the e-card is valid in a single host country for which it is requested. 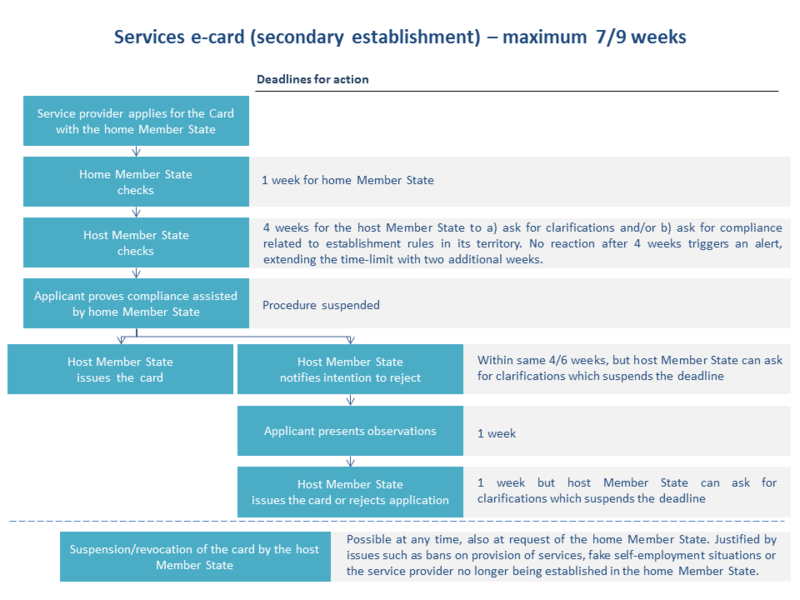 A service provider can only apply for an e-card for a given Member State and for a specific service activity. As such, a company holding an e-card for cleaning services in a given host country would not be able to provide engineering services on that basis. Separate applications for each sector and Member State are required. The e-card does not interfere with rules and requirements in the host Member States, which continue to apply. Host Member States are involved in checking that requirements are met. Service providers have to respect rules concerning social rights, employment conditions, tax-related obligations, etc. in the host Member State. 12. What impact will the e-card have on costs for service providers? Currently, service providers going cross-border may face costs as high as 10 000 euros linked to fulfilling administrative formalities only. The e-card should reduce such costs by up to 50%. This is a major added value for SMEs in particular. The actual cost savings will of course depend on the situation today, which differs between individual Member States. At the same time, set-up and operating costs for Member State authorities are expected to be low. The e-card will build on the existing Internal Market Information System (IMI) facilitated and funded by the European Union. More than 5000 federal, regional or local authorities are already registered with IMI, so there is no need for new bodies. 13. Will it not increase regulatory burden and bureaucracy? No, on the contrary. Currently, service providers complain about issues such as the lack of electronic options to complete formalities as well as procedures that are complex and take a long time. The e-card introduces a fully electronic procedure to complete formalities when going cross-border. It will streamline several administrative formalities, have clear deadlines to process applications and significantly reduce the need for the service provider to submit supporting documents. The e-card will be a voluntary solution for service providers to choose and will by no means be compulsory. 14. Can the e-card be cancelled, suspended or revoked? Yes, cancellation, revocation or suspension is possible. The e-card can be revoked or suspended by the Member State that issued the card or at the request of a host Member State whenever justified. When problems or issues emerge in the home Member State, all relevant e-cards issued to the provider would be revoked, irrespective of the host Member States concerned. In case of problems in a host Member State, revocation will concern the e-card for that given Member State but not others. Various situations may lead to revocation, for instance where a service provider has been banned from providing services, is no longer legally established in the home Member State or provided fake information on their self-employment situation. Suspension of an e-card works in a similar manner to revocation. An e-card can be cancelled at the request of the service provider at any time. 15. Which data will appear on the e-card once issued? 16. What are you doing about insurance? The European services e-card also aims to offer practical solutions in obtaining cross-border insurance coverage. The e-card will contain information about the existing insurance coverage in the home Member State and also other Member States covered, if any. Insurance providers will provide a statement of claims for the previous 5 years (unless contracts lasted for less than five years), which must be taken into account by insurers in host countries. This builds on existing practices: documents showing insurance coverage and previous claims already exist in market practice, but in disparate forms. Information presented in a simple and harmonised format will be easier to access, understand and use for both service providers and insurers. This will not impose an obligation on insurers to provide a given insurance coverage or affect their pricing policy. 17. Does this initiative have an impact on the existing rules under the E-Commerce Directive (2000/31/EC)? No, it does not. The provisions of this initiative cannot be relied upon to justify prior authorisation (or notification) schemes or establishment requirements which are prohibited by other EU acts governing the exercise of a service activity in a specific sector. This includes the E-Commerce Directive, which foresees that most information society services are subject to the law of the Member State in which the service provider is established and remains untouched. 18. What is a regulated professional service? A professional service is regulated if a person wishing to offer that service must first be authorised or obtain certification from a public authority. This is often the case for professions linked to e.g. health and safety, but may apply to many jobs, depending on the Member State: accountants, lawyers, doctors and nurses, teachers, carpenters, sports instructors and many more. Altogether, the 28 Member States have put in place over 5,500 regulations on professional services with different sets of requirements for service providers. These regulations affect 22% of the workforce or almost 50 million people in the EU. A profession might be subject to quite different requirements across the EU. Moreover, additional 'conduct' rules may apply, such as on company form, membership in specific organisations or annual training. Service providers are subject to multiple layers of regulation. 19. What is the proportionality test? How will it work? clearly identify the risk to consumers, the level of that risk and how specific measures work to guard against it. consider the effects of the new measure on business, job creation and consumers, taking account of the measures already in place (such as existing health and safety or consumer regulation). consider the accumulation of various layers of regulation to ensure that each is justified and guards against the real risks the specific measures aim to guard against. The test should be conducted as part of the decision making process before the new legislation is adopted. It will encourage objective evidence gathering and involvement of a wide range of stakeholders: consumers and service recipients as well as SMEs; not just the professional bodies or large businesses with the capacity to influence and cope with regulatory demands. 20. Is there evidence that these reforms will generate benefits? A mutual evaluation exercise carried out between Member States between 2014 and 2016 showed that Member States which have opened up their services now benefit from more choice and better price for consumers. For Italy, liberalising the market for over-the-counter drugs led to more pharmacies being set up and more employment opportunities for young pharmacist increased. In Portugal, reform of the accommodation and food and beverage sectors helped new firm registrations leap by over 1600 from the previous year. In Poland, new, objective access rules led to a doubling of new entrants for some legal professions, without negative effects on wages and quality. In Spain, there indications that opening up of the service sector makes it more attractive for foreign companies to invest. Various studies also confirm the positive effect of improved regulation of professions on job creation, the competitiveness of the business environment, improved productivity and GDP growth. Regarding job creation, one study estimates that between 3 and 9% more people can access a given profession if requirements are made less complex, while another shows this can make it easier for new businesses to offer their services or for graduates to find jobs. For example, according to a report by the French Inspection Générale des Finances (IGF) in France alone, estimated reforms in 37 selected professional services could increase GDP by 0.5% and create more than 120 000 jobs over five years. Furthermore, reducing barriers in European services could improve productivity by 5% according to a World Bank paper. 21. Are you forcing Member States to deregulate professions? Not at all. The decision to regulate a profession is the responsibility of the Member State, not the Commission. The decision to regulate needs to be evidence-based following a thorough, transparent and objective assessment. The Court of Justice has consistently held that such regulations have to be warranted as proportionate. For instance, regulation of services involving essentially the execution of instructions that do not require any special professional aptitudes would not seem to meet proportionality objectives (e.g. cases C-79/01 Payroll Data Services and C-76/90 Säger). The proportionality test and learning from best practice will help Member States to optimise their national framework for regulating professions. 22. Do you want to remove special professional qualifications such as the Meisterbrief certificate for German crafts? The Commission has stressed repeatedly that it has no intention whatsoever in this sense. Nor does this initiative in any way affect skills and quality. Indeed, the Commission appreciates the German dual education system as an important means to facilitate the transition from education to work and a success story in Germany contributing to the low youth unemployment rate. This position remains unchanged and is not put into question by the new proposals. 23. Is this going to result in lower quality of services? No. The high quality of European service providers gives us a global competitive advantage and it must be maintained. The proportionality test invites authorities to consider whether additional requirements bring real benefits and are the best means to ensure a high level of quality. Rules to ensure quality of service and give a guarantee to consumers will be maintained, contrary to those which don't achieve these objectives. 24. Will Member States need to assess existing rules or does it apply only to new rules? The recently conducted mutual evaluation between Member States has already assessed all rules currently in place. Today's proposal is for the future: when reviewing existing rules or considering the introduction of new ones. 25. Why do we need a legally binding proportionality test? A mandatory legal instrument ensures that all Member States benefit from a common methodology and are equally thorough in their analysis of proportionality of regulation. 26. What impact will it have on Member States with a federal structure? The proportionality test requires Member States to assess proportionality at one point before adoption of new regulation. The proposal leaves it entirely to Member States when exactly and at what level (central or regional) this test is carried out. It does not interfere with the division of responsibilities within a Member State. Member States are expected to conduct this assessment in the preparation of new legislation, just as the Commission does with its Impact Assessment. Importantly, the proposal does not bind the legislator as to the final decision. It does not prejudge the outcome of the national legislative procedure, but makes sure that all relevant aspects are considered. This approach is in line with the existing obligations of Member States established in the case law of the Court of Justice. 27. What is the aim of the Guidance? The Guidance indicates to Member States where regulation in professional services can be improved. It targets regulation which appears particularly heavy even if meant to support policy goals such as consumer protection or safety. For instance, it recommends to Member States to reconsider regulation which requires that all the shares of a company for architectural or engineering services have to be held by professionals, or regulation which reserves guiding tourists at a considerable number of sites to tourist guides having obtained a specific qualification. The guidance also contains a separate analysis per profession and per country, including a quantitative and qualitative assessment of the level of restriction. 28. How do the Guidance and the proportionality test link up? The Guidance complements the proportionality test. While the test is a measure to be used before Member States adopt new legislation or make any changes to the rules already in place, the guidance encourages them to adapt the existing regulatory framework for specific professions. 29. Are you looking at all professional services? No. This Guidance focuses on professional services such as architectural, engineering, legal and accounting as well as patent agents, real estate agents and tourist guides. Those professions were chosen because of their economic importance and the potential scope for further growth and employment creation. The Guidance presents an analysis of these selected sectors and offers specific recommendations to Member States on how to improve access to and exercise of those professions at national level. 30. Are Member States obliged to follow the recommendations? How will the Commission follow-up? The recommendations are not legally binding. However, the Commission will monitor the implementation of the recommendations together with the Member States and propose, where appropriate, measures to address remaining barriers. This could include enforcement action as regards possible violations of EU law or legislative proposals to address remaining burdensome requirements. 31. What is the restrictiveness indicator and what does it measure? The indicator measures how restrictive the requirements on access to and exercise of professional services are in the professional services covered by the Guidance. It looks at the scope of reserves of activities and at such issues as whether title is protected, the level of education required or the obligation to be a member of a professional organisation, etc. The new indicator reflects the most recent regulatory developments in the Member States, setting a benchmark across Member States and professions. This indicator accompanies the qualitative assessment and analysis which is the basis for the Guidance. 32. Why do you need a notification procedure for services? The notification procedure allows Member States and the Commission to work together to ensure that new rules on services introduced by Member States comply with existing EU law. It helps avoid the creation of unjustified barriers in the single market for services. 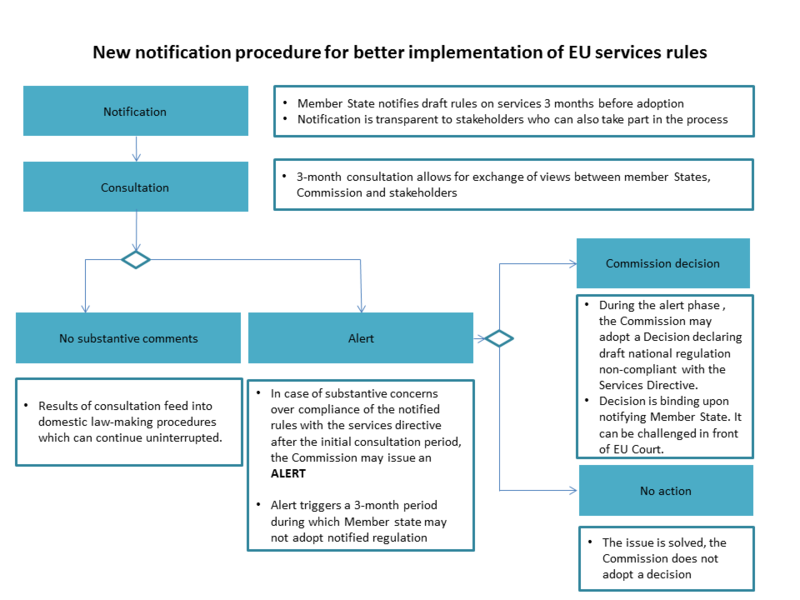 The notification procedure aims to ensure that Member States' rules on services comply with EU law before they are adopted and when changes can still be made. If compliance can be achieved before adoption, costly legal infringement procedures can be avoided and regulatory stability and predictability for business be improved. 33. What is the current notification procedure for services? Member States must notify the introduction of certain new requirements covered by the Services Directive concerning both the establishment of a services provider in a Member State and the cross-border provision of services. This allows other Member States and the Commission to comment on the notified rules and ask questions to the Member State that is proposing them. If necessary, the Commission can take a legally binding Decision requesting the Member State to bring the notified measure in line with EU law. 34. So why do we need a new procedure? Almost 90% of notified measures have already been adopted, so comments can no longer be taken into account in the national legislative process. This leaves the procedure without practical effect. The Commission can only take a Decision on a notified measure when it concerns establishment requirements and not cross-border provision of services. However, 86% of the total number of notifications in the period 2009-2015 also concerned cross-border services provision. The scope of the existing notification obligation is unclear and some important regulatory requirements falling under the Services Directive are not subject to the notification obligation, limiting its effectiveness (e.g. authorisation schemes). It is also unclear what the consequences of non-notification are. The quality of notifications is often inadequate. Stakeholders have no access to notifications that directly affect them. As a result, the existing procedure fails to prevent the introduction of unjustified regulatory barriers, so the Commission has to launch lengthy legal infringement procedures. In 2015, 40% of all structured dialogues launched by the Commission concerned newly introduced measures. This is why the European Parliament, Council and Court of Auditors called for an improved procedure. 35. What will be different in the new procedure? The proposal for a new notification procedure will oblige Member States to notify measures before the final adoption when adjustments to the new rules can still be made. It will also clarify and align the different steps of the notification procedure to facilitate compliance. Member States will be requested to provide more information on the proportionality of notified measures. The scope of the procedure will be aligned closer to that of the Services Directive – the obligation to notify draft measures will cover additional key requirements, such as authorisation schemes. Finally, the new procedure will provide for transparency for external stakeholders, allowing them to have access to the notifications. 36. How will the new procedure work? Under the new procedure, Member States will continue to notify the draft measures to the Commission and other Member States in the Internal Market Information System. A new interface will be created so that external stakeholders will be able to see proposed measures. The notifying Member State, the Commission and the other Member States have the opportunity to engage in a dialogue to discuss the notified measure and assess its compatibility with the Services Directive. This consultation period lasts three months, during which stakeholders can also issue comments. Where after the consultation period the Commission still has substantive concerns over the compliance of the notified measure with the Services Directive, it may issue an alert followed by a Commission Decision on the legality of the notified measure. The Decision would require the Member State to bring its national rules in line with the Services Directive. 37. How is the proposal for a new notification procedure related to the proposal for a proportionality assessment in the area of regulated professions? The proportionality assessment sets minimum criteria for assessing the proportionality of draft national laws falling under the Professional Qualifications Directive. The results of such an assessment must be provided as part of the notification for measures which fall under both the Professional Qualifications Directive and the Services Directive. 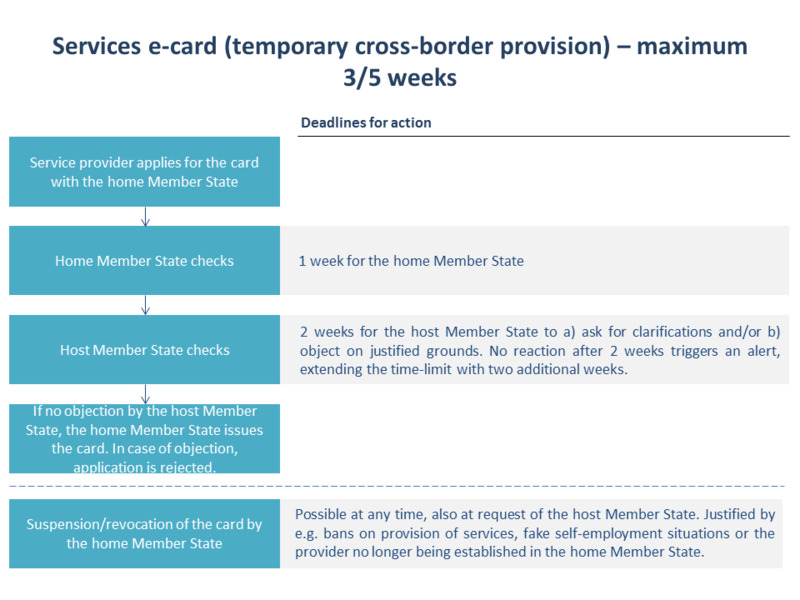 The draft legislative proposals on the services e-card, proportionality test and services notification procedure will now be sent to the European Parliament and Council for adoption. The implementation of the guidance will be the responsibility of the Member States. The Commission will monitor and assess progress, and may turn to other enforcement measures if progress is unsatisfactory. The European Council called for the different Single Market strategies to be completed and implemented by 2018.